A goal kept in your head is just a dream. The problem is… where do you write them down? 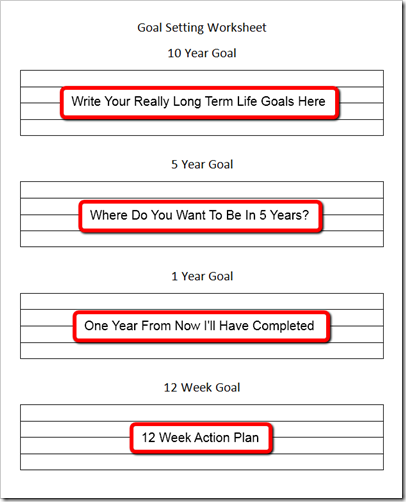 I want to make it easy for you today, to commit your goals to paper. Here are two simple tools to get you started. Just print them out and go! 1. 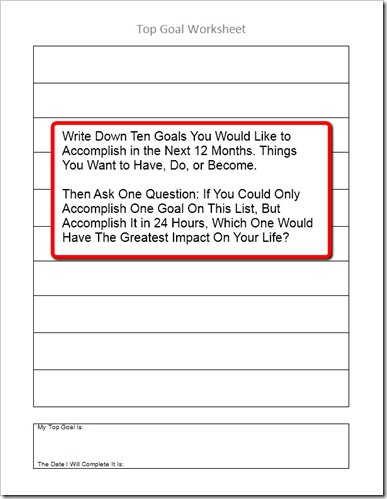 Goal Setting Sheet: Just download, print out, and fill in. This is a simple place to keep your longer term goals. Thinking long term can help you decide what you really want. Bringing it in closer, with one year and twelve week goals, will help you put plans in place to accomplish your long term dreams. 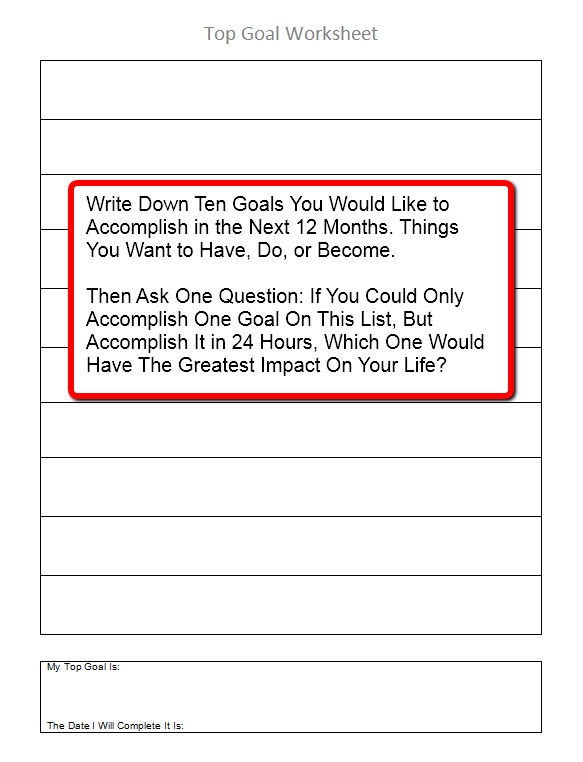 To help you figure out your top goals for the year, complete the Top Goal Worksheet in step 2 below. 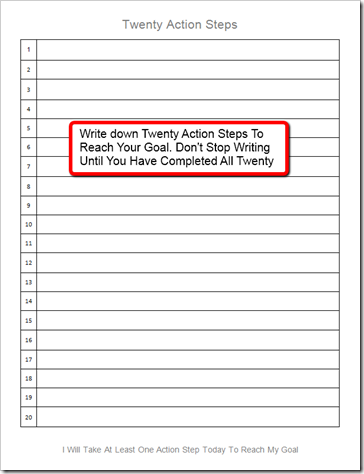 Follow the instructions and then fill in this sheet with your action plan..
2. Figure Out Your Top Goal and Action Steps. Here is a worksheet based on Brian Tracy’s Book, The Absolutely Unbreakable Laws of Business Success. He devised a four step process to help you find your top goal and come up with action steps to complete it. Write down ten goals you would like to accomplish in the next 12 months. Things you want to have, do, or become. Look at all ten goals and ask yourself this question. If you could only accomplish one goal on this list, but you could accomplish it in 24 hours, which one would would have the greatest impact on your life?Brian says in most cases it will jump out at you. 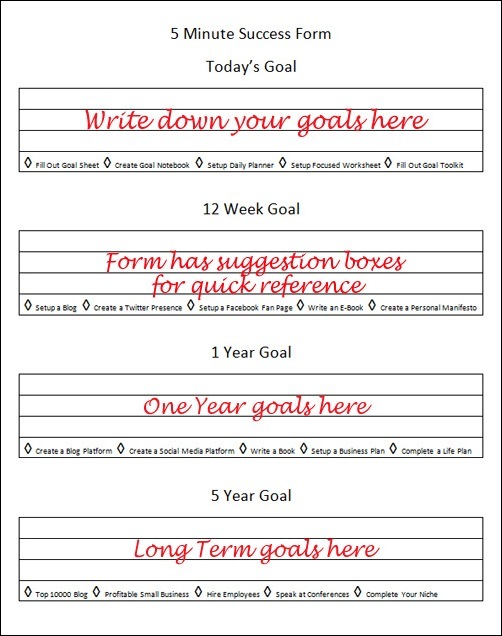 Write the goal down in bold writing in the bottom box of the sheet. 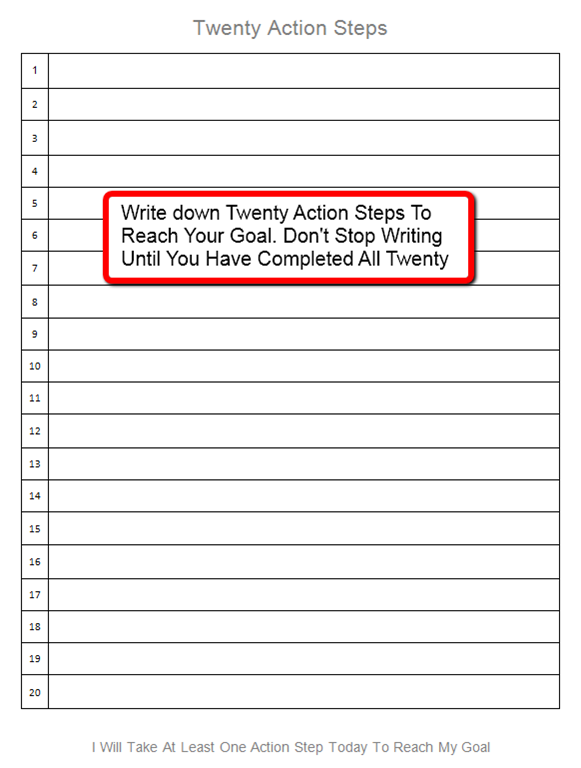 Print out the top 20 sheet and write down twenty action steps to accomplish this goal. This step will be easy at first but will become harder as you progress down the list. Don’t stop until you have filled in all twenty. Once you have your sheet filled in you can transfer them to your main goal setting sheet for easy reference. With your goals and action plans written down, you’ll want to put together a weekly and daily plan for success. We’ll talk about that in a future post. Now that you know the secret to setting goals, why not take five minutes and write them down. In years to come, you’ll be glad you did! Question: What are some of your long term goals? One of the simplest things you can do in life is to sit down for a few minutes and write down your goals. Yet over 90% of the population have never done this. The simple act of writing your goals down will multiply your chances of completing them. 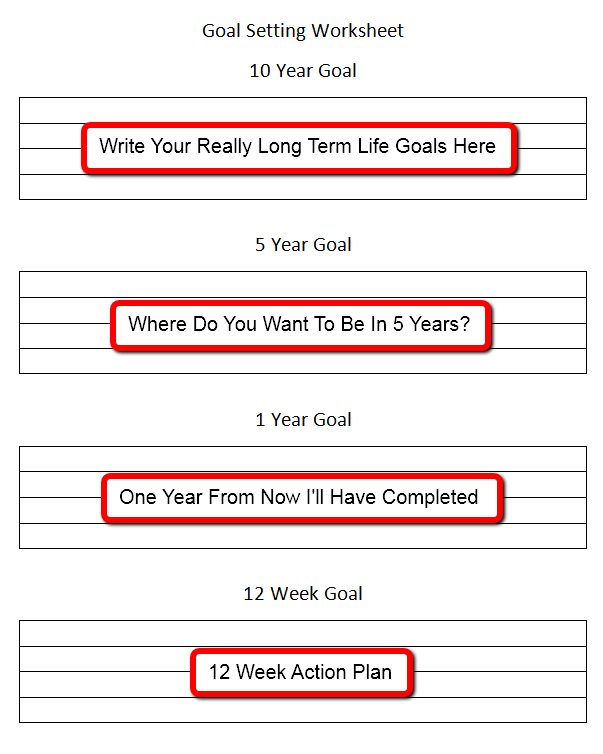 So… no excuses… right now… download this simple goal sheet and fill it out. In as little as 5 minutes you’ll have done something that the majority of your friends, relatives, and co-workers have never accomplished. When you are done, put this sheet where you can refer to it. Setting goals is really this simple, so take a few minutes now and change your life.